Kids love bright colors and Red Hearts Starbright colorway is the perfect way to get tons of color into a fun blankie. 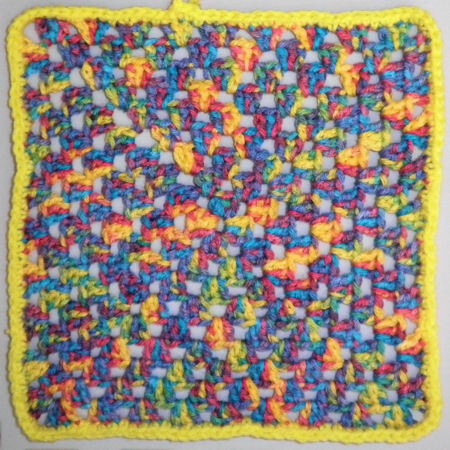 This blankie is basically a giant granny square in one color so the way a round is started varies from how it is done when using multiple colors. In addition, a larger hook is used to make the work go faster, or you can use the recommended hook for the yarn you choose. The image to the left shows a small doll-sized version of the blankie. Beg Ring With color A, ch 4, join with sl st. Round 1 Ch 5 (beg dc plus 2), (3 dc, ch 2) three times in ring, 2 dc in ring, join with sl st in top of beg dc (top of third ch). Sl st twice in first ch-2 sp, ch 5, 3 dc in same sp, ch 1, * dc in next ch 1 sp, ch 1, rep from * to next ch-2 sp, (3 dc, ch 2, 3 dc) in next ch-2 sp, ch 1*, rep from * to * twice, 2 dc in first ch-2 sp, join with sl st in top of beg dc. Rep round 3 until blankie is approximately 36″ square. Fasten off. Join color B with sl st to any dc around edge, ch 1, sc in same dc in ea dc around, 1 sc in ea ch-1 sp, 3 sc in ea ch-2 sp (at corners), join with sl st in first sc. Fasten off.